We are currently experiencing problems with safe access to the Club Launches for a period of around low water springs especially with high atmospheric pressure. There is still some confusion over whether we can or cannot use the remaining Marina pontoon for access to the launches. This being the case the Directors have reluctantly instructed the launch drivers not to use the pontoons. As there is also a problem with the concrete blocks placed by the club beside the slipway last year we are now informing your that there will be no access to the launches at low water springs where the water level prevents safe access to the launches. We are working hard to come up with an alternative but at this time we anticipate that no launches will be available on the following dates for approximately 50 minutes either side of low water where the tidal height is below 1m. The next problem tides will be on 5th May to 7th May as shown below. With thanks to Tony at Holyhead Lifeboat Station for forwarding this info. A 30 foot vessel with super structure has sunk in Holyhead Marina. At present there are buoys marking the wreck but nothing substantial at this time. Below we have published below the current version of our Club Sailing events which are fixed at this time. A number of away races have been listed which we think our members might be interested in. We are hopeful of running the Two Peaks, Ynys Llanddwyn and East Mouse races again this year. Watch this space! All those who have used the EU45 over the last 2 years have been very pleased with the results. 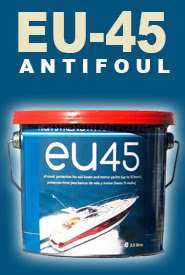 It is used on over 10,000 yachts in 6 countries and contains 45% copper oxide, almost 2 kilos per tin nd is ideal for all types of craft even motorboats up to 35kt. and all sailing boats and it has proved very effective in our high fouling area. In addition to the antifoul paint you can also order a different colour for a boot stripe, an application pack, thinners and primer. As last year we will ask you for a small contribution, suggested at £7.50 per order, to cover the admin costs for the offer. Once we know the exact discount we will invoice you. We intend to place the order by end of January for delivery mid February.